Well, it’s the day after Thanksgiving and if you’re like me, you ate too much yesterday. But that’s ok, right? At least once in a while it’s ok to overdo it a bit. It was a great Thanksgiving for us and I hope yours was the same. We are all back together (including my daughter who has been home from college for over a week now) which made the holiday extra special. Since most people are either out shopping as this posts or sleeping in and then taking in a day of family, entertainment, relaxation, and, of course, more food, I thought I’d have a simple chat with those of you who do show up. I’ll catch you up on what’s going on with me, the family, retirement, and so on. BTW, I’m not writing this on the Friday after Thanksgiving, though some of it sounds like that. I’m writing the first draft a few days before, updating it on Thanksgiving (if needed), and sending it out early Friday. That said, I wanted to write this as if it’s a conversation we’re having in real time. I want to start out by saying how thankful I am. I feel like the luckiest man in the world. I have a great family, good health, interests that keep me excited about life, and the money and time to enjoy all of these. It’s hard to imagine that life could be better, so for that I am very thankful, not only today, but every day. None of us knows how long we have to live, so I am blessed to have this life for as long as it lasts. I’m sure many of you are thankful too. I’d LOVE to hear what you’re thankful for if you’d leave your thoughts in the comments below. I have never been a Black Friday shopper — at least not in stores. Today I’ll send out a few Amazon e-cards to those people who have helped me this year (my property manager, a manager at the gym who gets my guests in for free, my pastors, my CPA, and so on) but that’s all the shopping I’ll do. No, today is a fairly normal day. I was up early, at the gym (no one was there — awesome! ), then out for a walk. Today I’ll take another walk or two, do some work, and watch some TV with my family. It will be a relaxed day and will certainly not involve going anywhere there may be crowds. I told one friend the other day that retirement seems busier than when I was working. How can that be? And how did I do all the things I did when I was working? The answer is I couldn’t do them all if I was working. Of course I’m now running three websites, two of which are fairly large, so that takes a lot of effort. But I really enjoy the time spent on them and it’s not really “work” at all. This is yet another reason that I should have retired long ago — I wouldn’t really have to sacrifice much on the income side as I could almost make my salary working only 20 hours a week. Ugh. I’m sure I missed at least 10 years of retirement, but it’s too late now. Anyway, this is why I advise people to retire as soon as possible given their spending needs and net worth levels. Anyway, it’s amazing how it’s the little things that can make you smile. My son got promoted at his last job (Great Wolf Lodge), then they hit the slow, after-summer season and promptly cut everyone’s hours. So we went back out on the job hunt and he now works at Costco selling phones. He loves the industry as he has a natural interest in phones. Plus he’s pretty outgoing so he’s a decent natural salesman. Not sure what the future holds for him but we’ll let this one ride at least through the holidays before we begin looking to upgrade. He got his car from my parents in August and now owns the nicest car in our family. He enjoys the freedom of having his own car but not so much the expenses associated with it (who knew you had to spend so much on gas?!) LOL! Just wait until he has to have it serviced — another “shock” expense! She was home again in early October for fall break and is now home for Thanksgiving. She goes back on Monday, then on December 5 I fly to Louisville and she picks me up at the airport (she’ll leave after her last final and drive there). We’ll drive some more that day, spend the night at a hotel, then drive 13 hours the next day to get home. At that time she will be home for good (hopefully with a job following soon thereafter) and I can leave the Colorado to Virginia cross country treks behind me. My mom and dad decided to retire, bought an RV, took it out a few times, and loved it. They had planned to get into it full time by the fall, but they were taking it slow and ultimately postponed the RV life until the spring. We’ll see if that happens. My bet is still on the summer if then. We found out a good friend of ours has brain cancer. It’s not clear what will happen, but it’s another reminder that life is short. It makes me glad I retired when I did. I would not have wanted to work all my life and then die. On the house front, we had a whole house fan installed in late August and it REALLY cooled down the house at night. Even in the short time we had it, our AC bill dropped big-time. It did cost us $2k but it’s so great for a cool night’s sleep that it was totally worth it. I had a physical earlier this month and the doctor said 1) I’m in great shape and 2) he wants me to be in even better shape. So I’m eating fewer carbs, more veggies and fish, and even some treats he says are good for me (like 1 oz. of dark chocolate and 4 oz. of cranberry juice a day). Not too bad overall. I’m still exercising six days a week — weights three days and cardio three days. I also get in over 16k steps a day (that’s my goal for the year — to average 16k or over). I didn’t get to climb Pikes Peak because I couldn’t find anyone to do it with me. Any takers out there? My latest appointment with the dermatologist assistant resulted in a discussion about a mole she found and didn’t like. I told her I had it for 54 years but she wanted to take a biopsy. So she did and it was nothing but a mole. Now I’m wondering how to balance diligence and reason in looking out for my skin. At this rate I’m going to look like a sad pincushion after a few years of seeing her. The movies have dropped off a bit the past few months since there hasn’t been much to see. My daughter and I did go to Bohemian Rhapsody this past week and the family has a few more planned over the next month. One of the places our movie time has gone is into TV. We’re now into “Countdown to Christmas” on the Hallmark Channel and have something like 25 new movies to watch between now and Christmas. I even downloaded their app to make sure we see them all. Once those are over, “When Calls the Heart” begins and we’re off on another season. Yes, they are sappy movies and you know what’s going to happen. But they are like potato chips — so feel-good that you want more. I traveled some since my last update. Of course there was the drive to Virginia (and flight home) noted above. And you know about our trip to DC. In between those two I worked in five days in Orlando for FinCon, the financial media conference. It was so great to meet so many people I “know” from online. Coming up I have the flight to Louisville and drive home. Then early next year we are going back to Grand Cayman. Can’t wait for that one! Things are still going well with ESI Money. It will make $40k or so in revenue this year which is very nice for an unexpected retirement income. I have some great millionaire stuff coming up as well since we’ve now passed the 100th interview. One question I have for those of you who have made it this far: What do you think of the ESI Scale interviews? Are they interesting or not? If not, could they be made better (maybe with better questions — if so, what questions) or are they simply not your cup of tea? I’m asking because they are the lowest traffic days on my site and, of course, I’m always looking to improve. I have them scheduled into January, but if interest doesn’t pick up I’ll be moving them to less-frequent appearances. Rockstar Finance is doing well too. We’re going to change things around a bit to better serve our readers, websites, and staff, so look for those coming soon if you’re a reader there. If you aren’t and want to be, you can get an email every day with the best personal finance posts by subscribing to the Rockstar Finance newsletter. I still update our retirement budget every month and I’m still pulling money out of Lending Club and Prosper. I’m down to about $20k with Lending Club and $10k with Prosper. I will keep withdrawing until nothing’s left. We have dropped the idea of buying a rental place that my daughter could use. If she stays in the area she has a friend who she wants to live with. Besides real estate is so sky-high here I’m not sure I can find a place I would like price-wise. So, that’s my chat for today. Nothing earth shattering but I felt like I just wanted to catch up with my friends. I hope you’re having a great day and have an awesome weekend! Lol “23 hours of praying in” you sound like such a stereotypical 1980s TV dad ? I read some of the interviews, but at some point there is not so much you can learn new from them. Same thoughts on the ESI scale as Lily and Juan. Even though I participated in the scale interviews, they’re just not as fun to read as the millionaire interviews. I do read them to compare and see how others are doing relative to my own progress, but I typically skim them a bit faster. I’m 40 and holding solid in the millionaire stage of life which is why I skip the ESI scale interviews. I click on just about everything else of yours that comes through my reader. I personally do not ever read the millionaire interviews. Just not my cup of tea. Funny that you mention it, but I was wondering if I’m the only one who is skipping Scale interviews. Just think this is not the right audience for it. As a young professional, I enjoy reading your ESI interviews to see others in my age group and how they share my interests and what they are doing. It’s a good learning experience and it keeps me going. Believe it or not, the title “millionaire interviews” turns me off! I know crazy, right? I read everything else on the site, and love rockstar finance as well. This was like a nice Christmas letter. I had to work Thanksgiving (nurse) but that’s OK, the hospital fed us good. I am most thankful for my family, my good health, my safe place to live. And of course all my material possessions but I am trying to be less of a “material girl” I would be in shock if I had lost 250K in the stock market…most of mine is in cash because I have already been through 2 big losses, and it’s frightening. We are going to see Bohemian Rhapsody next week. Did you like it? About the ESI scale interviews. I guess for someone starting out it might be interesting, I read one or two but don’t anymore. I have enjoyed many of the millionaire interviews but don’t have time to read every one. I did like the movie. I might see it again when it makes its way to TV. Thanks for the Thanksgiving post. Your updates always make me happy! I’m so glad your sites are doing well. ESI was my intro into FIRE and still my favorite. Rockstar Finance is my second favorite. I love the Millionaire interview but am less excited about the Scale interviews. I guess I’m more interested in those that have made it vs. those on the journey. Enjoy your time with your family and keep up the great work! I am in my 20s so I find the Scale interviews helpful. I often find myself comparing my situation to theirs. Perhaps there is a comfort factor in seeing someone “doing well” and recognizing that I am doing similarly? I think it is a good forum for people earlier on in this journey to ask the questions they have of a more experienced audience as well. In fact, I think the comments are often most helpful. I think Emily makes a good comment and the right rationale for continuing the scale interviews. The ESI audience is a mix of folks who either have made it or are in the process of making it. Not everything on the site has to apply to everyone. I usually read them and make a comment if I think I can be helpful but most folks in this category benefit from just staying focused on the ESI principals until they have saved and invested enough to be interested in more sophisticated investing options. I’m sure people starting out get more out of the Millionaire Interviews than Millionaires get out of the scale interviews but there is nothing wrong with that. I tend not to read much of the scale interviews. They all seem similar and there isn’t really much I feel like I’m learning from them. I like reading your millionaire post, but I’ve never read a scale post. I’m not clear what you mean by scale, so I skip it. I do love these personal posts though. It’s funny, I hear so much conflicting info about whether or not to share stuff about yourself on your blog, but I think that’s what makes a blog enjoyable to read. I have each person rate their performance on a scale of 1 to 10 for E, S, and I.
I read it all, and your blogs are my favorite. I am very close to retirement and work about the same hours as you, 20/week still in my profession. As I go along, I find it helpful to collect tips, and each article has something. No doubt you will continue to evolve and refine. I will still read them all. I feel your pain with the Lending Club withdrawals. I’ve been working at it for a while and I’m almost done. It was SO GREAT at the beginning, then they had to go and get greedy. C’est la vie. I’m extra cautious with similar companies these days (like in the real estate space where you can buy small shares of commercial buildings). I like the concept, but there are too many dead bodies in that pile. Scale Interviews – not so much. Even some of the millionaire interviews are a little too TMI. One of my biggest concerns about early retirement is lack of structure/purpose. It would be nice to see more questions targeting what people do to fill their days during early retirement. Not everyone is inherently disciplined or have a lot of activities outside of their professional lives. It would be interesting to hear about the diversity of activities and part-time work / side hustles early retirees engage in. In addition, for those who choose to retire early with more modest wealth/income, it would be interesting to read more about the creative ways they save money and/or stretch the resources they do have available. I also think this is a good topic. While I hear lots of FIRE people in their 30s with no kids really enjoying FIRE, I struggle to relate. Being 47 and having 3 kids, I need to set an example for my college age kids. When they are through I should be set to FIRE or at least do part time but I worry about life structure as I’m up at 4 or 5am even on the weekends. I’m bored easily. ESI, yes, please write a post on this topic! I may retire in less than a year, and while I have lots of interests, and some plans for retirement projects and activities, I feel I could benefit from more input regarding structure and purpose. I like the Millionaire Interviews, but usually skip the Scale interviews. I am also in the process of drawing down my LendingClub account and have been putting that money into a variety of different short term and long term savings goals. I have about $400 left to go. I’m glad you posted today–something to read while I am at work doing very little–the phone is not ringing and very few people are coming to the office for anything (probably because they assume that we are closed.) Happy Holidays! Thanks for catching us up! 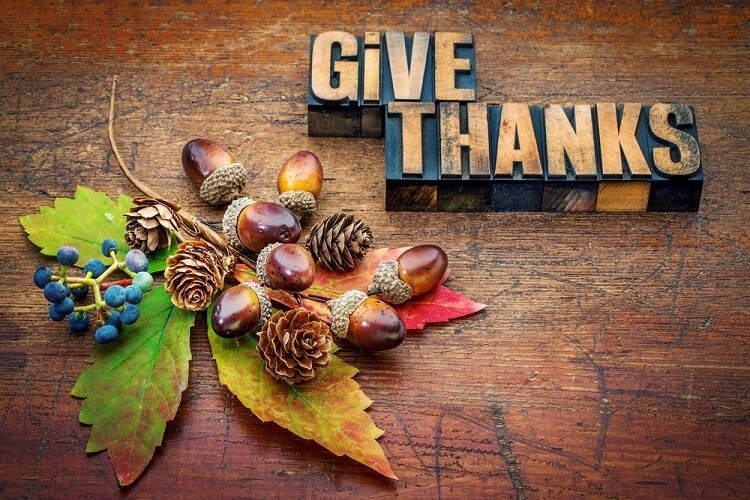 I’m thankful for a healthy family and great friends on and offline. I just spent 4 days in LA with my son last week and learned yesterday my daughter is expecting her second child in June ’19. Like you I’m enjoying not reporting to an employer but I’m working more than ever on three websites. 😉 Spending today relaxing mostly but getting some work in…no shopping though. I don’t read many of the scale interviews…due to time mostly. Have a great weekend and happy holiday season, John! Both my husband and I are thankful for our retired life. We appreciate each day. After 2 years of retirement, we both comment often to each other how lucky we are. Of course, luck isn’t part of retiring early, planning, saving and scrimping over the years is required. We are thankful for 90 nights of travel away from our home base during 2018. Hawaii is coming up next week and for 3 weeks since we have the time. What a blessing. The market did take a large decline, I am nervous but accepting since down is part of the up cycle. Sold some items and others are being kept for dividends. I like the Millionaire Interviews, but usually skip the Scale interviews. Since I am retired, reading about saving is not needed as much but for people beginning, ESI is valuable. I would like to see other suggestions on activities for retirement and travel ideas. Right now, we are busy with travel, volunteering and local activities, but learning other ideas is helpful. Thank you for your updates, always interesting. I enjoyed reading this. You seem as if you’re at a really nice stage in your life. I have a gamer son and I laughed when you mentioned the hours spent gaming. He’s pretty much the same. In the quest for knowledge reading all that is available and us well done provides for greater satisfaction and compliments the learning process. Keep up your good work, so all may form their own way to their own goals. In general I’m very thankful for everything I have… like everyday…but Thanksgiving made me reflect more than usual as my father-in-law is struggling with cancer. My health is not perfect but sometimes being in your 50s means things happen- nothing too major. I’m fortunate I have a super wife and kids so beyond that is all bonus in my eyes. I read a lot of the articles including the scale interviews. Always something to learn and it’s good to see some doing so well. I usually read all the millionaire Interviews but they give me mixed feelings. From one perspective I feel competitive when some have more money. Silly huh? It’s kind of in my nature to compete but maybe I just wonder if I get too lazy sometimes and should work harder. Lol. On the other hand I wonder if some people realize how well they truly have it. It’s easy to get caught up in the rat race and not realize how fortune things may be. One thing if feel very strong about wrt ESI. I feel the most important ingredient is ‘E’. ‘I’ is second. But ironically, as I’m a decent saver and don’t spend too compulsively, I hate reading about people that obsess about Saving. Money won’t buy everything… but hell you gotta live in the now too. So focus on ‘E’ so you don’t have to worry about damn ‘S’ so much. My thoughts are flowing faster than I can type and I got to meet the wife at Starbucks for my Mocha. Enjoy life everyone! Great website EsI. Thanks for sharing your update! Glad you’re enjoying your family and I’m sure it’ll be nice to have your daugher home again! I started to read the ESI scale interviews but have stopped. Still read the Millionaire interviews. Great update. I enjoy your writing style and read all your posts. I enjoy both the Scale and Millionaire interviews, and read them all. I am thankful every day for everything the Lord has provided. You asked if we could share what we are thankful for. So much! My faith and family. My awesome wife (definitely married up). My great kids. My first grandchild, John, who was born just five days ago. A satisfying 40-year career in libraries. No debt. Reasonably good health (but need to lose about 30 pounds). Also very thankful for our faith-based financial planner, who we found five years ago. He showed me and my wife some tough love…he kicked our butts over our few remaining lazy money habits, got my wife and I to communicate more effectively about money, and helped us get our financial house in order (including updating our wills and setting up an estate plan). We are now much better positioned for retirement. We have saved a lot of money buying things on Black Friday or Cyber Monday. While I do hate shopping and shopping in crowds in general, I don’t mind them if I have a purpose. I did live in NYC for 10 years, and the area most of my life. When we bought our home, we got very old appliances. Coming from an NYC apartment, we had very few items, and no appliances. As the years have gone by, we’re coming up on 7 in January, we have replaced pretty much all of them, and one TV. The fridge we got replaced one that was not failing, but was starting to use a lot of power. I have a kill a watt meter, and they are a great cheap tool to tell you how much electricity appliances use. Well, the fridge was using about $25 a month of power. We went to HD a few years ago, when this went down, and purchased a new fridge for 50% off with free removal and disposal of the old fridge. Now I had to hook up the water line myself for this fridge, but that was fairly easy to accomplish. I will not waste your time in detailing the rest of the deals we got over the years for the rest of them, but the deals were in that range. Generally, if a machine broke near BF, then we’d limp by until it was BF for the savings. We would also replace things that were starting to go for that reason. Our oven for instance, after a call to GE to get a replacement part, the reply was astonishment that the old unit was still working. We limped by with limited functionality until BF. I’ll climb Pikes Peak with you! I live in Longmont, CO and have done some 14’ers. Also, I do scan the Millionaire Interviews. While I enjoy them, they are starting to feel a little repetitive. I enjoy variety, including the ones written by women and ‘lower’ income earners (~$100k). Thanks! Awesome! I’ll put you down on my list. I’m (hopefully) building a team of hikers. I read both the Scale and the Millionaire Interviews. My favorites are from people who are lower income (100K) and are working on it or have succeeded. What am I thankful for? Family, friends, faith. I always keep an eye out for BF sales. It’s a bonus if I can do it all online. I never get up and go out early. That’s crazy stuff. But a lot of times I can go at 9 am and be done by 1 and have snagged some good deals. I used $5 off Amazon book promo and pre-ordered Everyday Millionaires….should get it by early January. I read the Millionaire interviews( finding them more interesting in my current situation being 61, millionaire and retired) and my 27 year old son likes to read the Scale interviews as they pertain more to his life. I like the scale interviews just as much as the millionaire ones. I’m close to 40 as well as close to the million mark and I find them very insightful. When I’m caught up on reading my financial blog posts, I read the millionaire interviews. When I’m not, I skip them as they tend to invite more of a feeling of “shoulda done better” then being inspiring. I usually start the ESI ones, and tend to wander off if they make a ton more money than me. I’d like to see more interviews with people like me (over 40, not an above average saver in the past, also not great income) but I know you get volunteers, and might not get many of those. I plan to drop you a line, but I have to get my financial blog set up first. I’m a faithful reader (I must be, right?). to be honest, I’m not a big fan of the Scale Interviews. I’m not sure why. I read them, but maybe it is the self grading part? meh, not sure (shrugging emoji). I would be up to climb Pikes Peak, or another “easy” 14’er. It is on my list of things to do. My daughter, a HS junior, is interested in either CU or CSU. We’ll be out at Copper Mountain for Presidents day, and will hit Ft. Collins on the Tuesday before heading back to NJ. We’ve already toured CU. We would probably do it in the summer time. Would that work for you? I assumed it would be in the summer. If I can make it I will, but you do what you need to do! A lot of the scale interviews come across as pitches for blogs -at least a lot of the ones I read. I’d be more interested in ‘normal’ guest blog posts where people write about things they are good at or know about. Thankful? Oh yes, including my mother who celebrated her 100th birthday the week before Thanksgiving. I read the ESI Scale interviews for talking points with our sons who are in their early 30s and as a nostalgic flashback to when I was much younger and striving to improve our net worth. The Wall Street Journal has had some interesting articles about retirees who have trouble switching from asset accumulation mode to asset spending mode. Perhaps a short set of questions could provide good ideas for others who are in retirement transition whether they are millionnaires or not. I personally love the millionaire interviews. Not so much the scale interviews. I’m not 40 years old yet and work in a ministry setting, so my income is way lower than the millionaire interviews, but it still inspires me to be “weird,” as I’m often called. Then I get asked for my advice on what I’m doing financially. Hahahahaha I read them while getting ready for work in the morning. The scale interviewees sometimes seem a little bit arrogant. Maybe I’m misinterpreting what they are trying to say. A lot of them are very young also, so I think that has something to do with it. Yours is one of my very favorite financial blogs to follow. Thanks for all of your hard work. I agree with the millionaire interviews coming from women and lower incomes are extremely interesting. But it’s already been mentioned how these are on a volunteer basis, so I understand. Thanks again!